A few years ago Candlewick Press published the very cool, very thorough, Movie Maker: Everything You Need to Know to Create Films on Your Cell Phone or Digital Camera!. This kit includes everything from tickets to hand out for the premier to a CD of sound effects, a story board book to help plot out the movie scene by scene, and a fantastic Director's Handbook that covers everything a kid needs to know to film a movie. Now with Animation Studio: Everything You Need to Create Stop-Mtion Pictures on Your Cell Phone or Digital Camera, Helen Piercy, a professional animator who runs her own animation workshops for kids in schools, museums and theaters with the goal of "inspiring young people through storytelling, character crafting and film making fun" has written an animation handbook and created a kit to get kids started making their own animated movies! 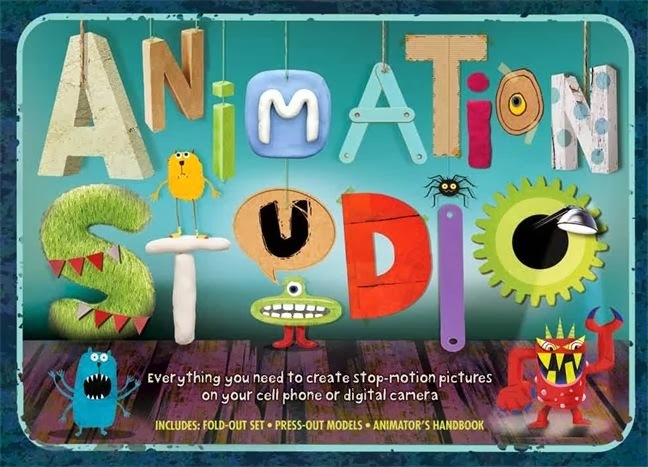 The best way to find out all the great things about Animation Studio: Everything You Need to Create Stop-Mtion Pictures on Your Cell Phone or Digital Camera is to scroll down and watch the book trailer. But, I'll do my best to describe all the great goodies that come in this kit! The handbook teaches kids how to build a story board, design a character, set the lighting and use camera angles and special effects to make the movie even more amazing. After brief and wonderfully illustrated chapters defining animation in which kids learn about the thaumatrope and zoetrope methods of animation, Piercy teaches kids about creating a character, storytelling and how to direct. 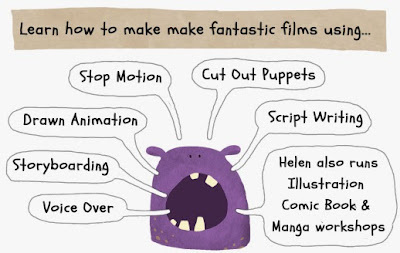 Then she teaches kids about the various kinds of animation they can use in their movie - from traditional to cutout to board and clay animations, to 2-D, 3-D, puppets and shape-shifting. There is even a chapter on complex model making, object animation and pixilation. Piercy wraps up the book with a chapter on that crucial step - editing. Best of all, the kit itself turns into a movie set! 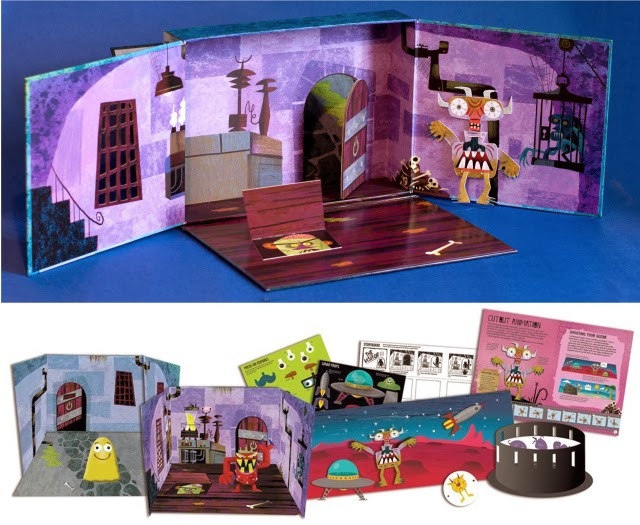 There is also a press-out monster with movable parts, press-out props, storyboard samples and blank sheets. Thank you for such a wonderful review! If your sons do make a animation using the kit I would love to see it! Helen - I am honored that you read it! And I definitely will put up movies that my boys make. Thanks for reading and for the fantastic book and kit! !